Here it is, the collaboration of a country wildman and 3/4ths of one of my favourite bands ever. Lets put things into context right away. As a die hard Pantera-fanboy and resident Dimebag-worshipper, the starting point for this review was anything but objective. The man’s name spells superior quality in my cortex. Don’t expect slight slips to be counted as harshly as for a more obscure artist. Another thing - one that creates a bit of a contradiction: I am anything but a fan of country music. Most of it makes me nauseous. To emulate Dave Mustaine a bit, hearing something like Achy Breaky Heart doesn’t evoke any desire to be romantic, merely extremely violent. Luckily, the cowboy-jodling and Pantera’s brand of airtight metal make a miraculously good couple. Granted, considering the cast at play, I expected highly of the results, but was also pleasantly surprised. 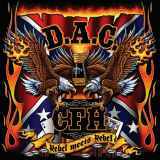 The first thing to hit metal fans to radical opposites in my view will be David Allen Coe’s voice. The outlaw legend gruffs in a very distinguishable croon, that one can very easily place into the bar scene of a classic western movie. I predict that his singing will create very polar love-hate reactions. I personally like it very much. It ain’t on a grandiose Dickinson-level, but the down n’ dirty-style fits this jamming music perfectly. Coe’s voice has tons of charisma and the feeling of a thousand bottles of bourbon and desert dust to compensate the lack in metalesque range. The music itself is total killer. I’d say the metal elements upstage the country in amount and feel but as I expressed, the mix is brilliant. The country on this album is more old school anyhow, without the plastic tumbleweed-sentimentality that occasionally litters even distant Finnish radio stations. The rootsy elements really add a different perspective into the moshing mayhem. Despite Pantera’s excellence, it had confined itself into a very tight framework with its style where experimentation was extremely questionable. Such is not the case here, as the band has no prefaces and a freedom to just rip. The playing has a loose, jam-like vibe to it that remains tight with space to breathe and groove along with it. There we have my mandatory magic word of fellating reviews again: groove. And how, DAMNIT this stuff grooves. I dislodged bones and muscles I didn’t even know existed in my feeble body while listening to this. From the rocking rollers like Nothin’ To Lose and Cowboys Do More Dope to the marvellous tear jerking duo of Heart Worn Highway (with it’s excellent, flamenco-tinged lead-off instrumental, Panfilo) and Arizona Rivers (with an opening remarkably similar to This Love) everything has a huge emotional charge that emanates from even the smallest of amplifiers. Doesn’t matter where you play this. You can truly feel the music. The humorous fiddle solo in the title track or the Indian-howling in Cherokee Cry show you that this record wasn’t made with a stiff upper lip, which is how it should be with all music. Dimebag’s guitar shreds are totally off the hook with humongous riffs and sizzling solos to spare, proving how much this man had still left in him. Vinnie Paul and Rex Brown uphold their position as one of the finest rhythm sections in metal history with a rock solid backbone. Need I say again that they groove like all hell? Get Outta My Life is the most modern track here, with a strong Kid Rock-feel, especially in the arrogant lyrical blasting. Although the mere relation of KR’s name is enough for some fools not to touch the stuff, this southern-boogie-brought-to-2006-feel still carries the song off well. N.Y.C. Streets is one of the best ballads I’ve ever blessed my ears with. It just oozes with streetlighted grit and emotion. If you’ll allow me to be overtly sentimental here for a bit, this tune has lately not only helped me through big personal setbacks, but also inspired a few songs of my own - already upon the first hearing. Usually such songs take weeks at minimum to cause such inspiration. Overall, I love Rebel Meets Rebel. I wouldn't be surprised if a lot of people couldn't stand this album, but them's the breaks. It combines two unlikely bandits of styles together seamlessly. Especially recommended situations for breaking out this album are huge parties, situations of light-to-severe intoxication, driving down the speedway (preferably with a convoy of cop cars in tow) and dreary, star filled nights that are spent with a cool brew in hand. A fun summer record for the ages. If it wasn’t for the Devin Townsend Band and the upcoming summer delights of Blind Guardian and Strapping Young Lad, I would not have hesitated in slapping an Album Of The Year-skeleton with this review. In the current situation, consideration is still needed. Now it’s time for a drink and another spin.